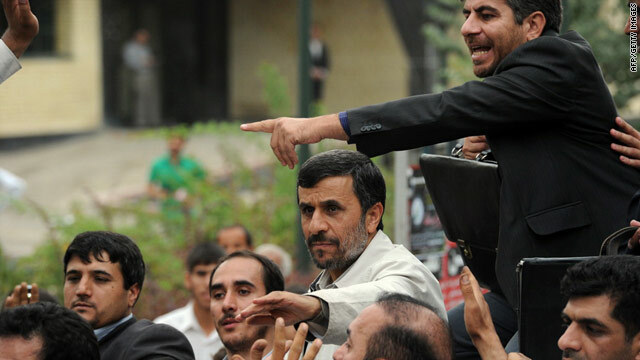 Bodyguards surround Iranian President Mahmoud Ahmadinejad (c) as they react to the incident in the city of Hamedan. (CNN) -- Iran denied reports of a grenade exploding near the convoy of President Mahmoud Ahmadinejad during his visit to a western Iranian city Wednesday. The semi-official Fars News Agency and several other outlets had reported the incident, in which Ahmadinejad was unhurt. But the media department at Iran's presidential office denied there was an attack. Media advisor Ali Akbar Javanfekr told CNN that the grenade was a toy firecracker and accused international journalists of blowing the story out of proportion. "This was someone playing with a firecracker, the kind children play with, the kind you use when you want to celebrate," Javanfekr said. "This was a toy and there were no injuries but the western media took and made it bigger than it is." Despite the denial, there was an account about the incident on Raja news, a rightist website linked to some members of parliament that has in the past both supported and criticized Ahmadinejad. The site reported there had been a grenade attack and quoted the Fars news account. Someone lobbed a homemade grenade just after the president's motorcade went by, Fars reported. The suspect was arrested, according to both reports. The grenade exploded during the president's visit to the city of Hamedan, reported parlemannews.com. The account was also carried by the conservative website Khabar Online. The presidential convoy was headed from the airport to the city's sports stadium. The reports also said that Ahmadinejad warned on Tuesday that "Zionists" were plotting to kill him. Iran uses the word "Zionists" to refer to Israel. White House aides said they were aware of the conflicting reports, according to a senior U.S. administration official, and were seeking more information to sort out what happened.